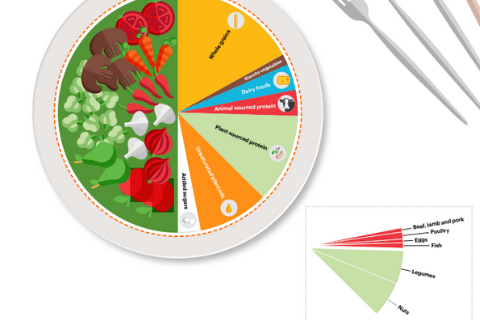 “The world’s diets must change dramatically,” said Harvard University’s Walter Willett, one of the leaders of the comprehensive EAT-Lancet report released this week researching healthy and sustainable diet. The findings show we must drastically cut down on meat and dairy, and eat more plant foods. Published after three years of reviewing extensive evidence from around the world, the message is similar to that of both the British Dietetic Association’s One Blue Dot campaign, the government Eatwell Guide, the World Health Organisation and recommendations made by various non-governmental health organisations, for example World Cancer Research Fund (WCRF) and the British Heart Foundation. · The report acknowledges that some nut and legume crops use intense water farming. However, the evidence for their associated reduced cardiovascular disease, cancer and total mortality risk justified this environmental trade off. Added sugars – no more than 5% energy intake – approx. 30g or 7tsp per adult per day. * EAT-Lancet recommended diet as well as an average daily intake, also provides a range of intakes. Calcium: The United States and other countries over-estimate calcium needs. It is ubiquitous in the diet and there is little evidence that intakes above 500mg per day improve bone health. – reducing marketing and availability of unhealthy food. It also tackles farming changes to a high degree – seen as being as important as, if not more than consumer change. We need to make big changes in our eating patterns if we’re going to protect our planet and health. It requires a multi-system combined effort approach to reduce food waste/losses, improve food production and encourage dietary shifts.